Sage shares her trail tested knowledge to help you have successful adventures. Ask an expert your hiking questions, and skip the harder parts of the learning curve! Sage and 5 other long distance hikers share invaluable advice on solo hiking as a women in Backpacker magazine. This all star crew of adventurous women share 18 tips for walking alone. Light weight backpacking techniques requires you to mercilessly analyze every piece of gear in your pack. It takes innovation and a simplistic attitude. Sage offers tips and tricks to lighten your load. The Oregon Desert Trail (ODT) is an 800 mile route that stretches from the Oregon Badlands Wilderness to the Lake Owyhee Reservoir near the Idaho border. The Japhy Ryder Route is a 1,300ish mile lightening bolt shaped route that starts at the Pacific Ocean and ends in Death Valley. Stretching 2,150 miles from Maine to Georgia along the Appalachian Mountains it travels through 14 states. The Appalachian Trail is America’s original long trail, and provides a wild strip of adventure amid the population dense eastern edge of the US. 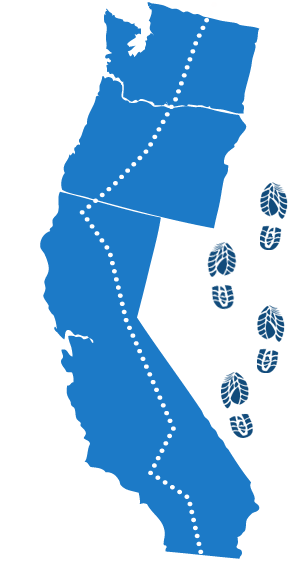 The Pacific Crest Trail stretches 2,650 miles from Canada to Mexico along the crest of the Cascades, Sierras and a handful of other mountain ranges. Sage Clegg volunteered to become the first person to hike the entirety of [the Oregon Desert] trail. In her day job, Clegg studies desert tortoises as a wildlife biologist. But as a long-distance hiker, she’s known for her speed. “Some people love curling up with a good book. And I just really like looking at maps. I read them like they’re a book. I look at them and try to get a sense of what it might be like to travel out there,” Clegg says.